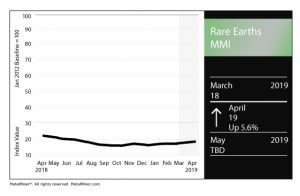 The Rare Earths Monthly Metals Index (MMI) picked up one point, rising to a value of 19. Australian rare-earths miner Lynas Corp., as we’ve noted in previous Rare Earths MMI reports, has been facing regulatory pressure in Malaysia of late. The Malaysian government has issued two conditions for renewal of the miner’s license in the country, which expires in September, related to disposal of two types of waste. Last month, Lynas appealed one of the conditions put forth by the government related to disposal of water leached purification residue. As such, the miner is considering building out initial ore processing near its Australian mine, Reuters reported. Lynas is the biggest miner of rare earths outside of China. The company received a shock last Friday following comments by Malaysian Prime Minister Mahathir Mohamad, who indicated the miner’s Malaysian operations were being put up for buyers who can make good on cleanup of the radioactive waste. “With regard to Lynas, we have imposed an extra condition, that is they must take away the waste,” Mohamad said. “But they want to take away the waste to where? They want to take it to Australia, but Australia doesn’t want to accept it, so they can’t do it anyway. The comments came just over a week after Lynas rejected a $1.5 billion takeover bid from Australian conglomerate Wesfarmers. Meanwhile, in perhaps promising news for Lynas, the Sydney Morning Herald reported the government of Western Australia has indicated it would consider offering assistance if the company should decide to build a new processing plant in the state. Speaking of China, the country exerts an overwhelming dominance in the rare earths market, which includes materials used in a wide variety of high-tech capacities, from smartphones to laptops and more. Now, China is also the world’s top rare earths importer, Reuters reported. Citing data from consultancy Adamas Intelligence, China’s imports of rare earths surged 167% last year. 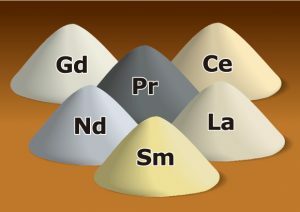 In addition, China became a net importer of at least seven rare earths, including praseodymium and yttrium, for the first time in more than 30 years. The yttrium price fell 0.3% month over month as of April 1, down to $33.52/kg. Terbium oxide rose 4.7% to $465.52/kg. Neodymium oxide dropped 5.2% to $43,573/mt. Europium oxide fell 0.3% to $38.73/kg. Dysprosium oxide jumped 15.4% to $218.98/kg.